Who would have ever guessed that the training program I fought so much in the beginning would turn out to, not only save, but it would return my life back to me. Coming from a life time of drug addiction, I had grown accustomed to spending millions of dollars on rehab programs, physiologist and other medical professionals and treatments to survive day to day. With my past, I had full acknowledgment and understanding based of my self-induced diseased and destructive lifestyle, that I had no real possibility of living long due to the damage I had caused. It was no surprise that those around me had given up on me. In fact I too gave up on myself and expected to die young, and end up as another statistic. But something happened that I couldn’t avoid no matter how I tried. I kept hearing about the Theiss Miracle from the famous rehab professional. He had been boasting about thousands of success stories from around the world and he was also boasting about his own personal Theiss Miracle that transformed him into the best health and conditioning of his life. Why this was so astounding to me, was for the fact that this man, before being a rehab specialist, was a world class athlete for most of his life. He was 60 years old but had the physical body, mental sharpness and health of a 20 year old! Could this happen to me? I couldn’t get the thought out of my head. The other thought that persisted was: “I deserve one more chance”. And that chance I got. 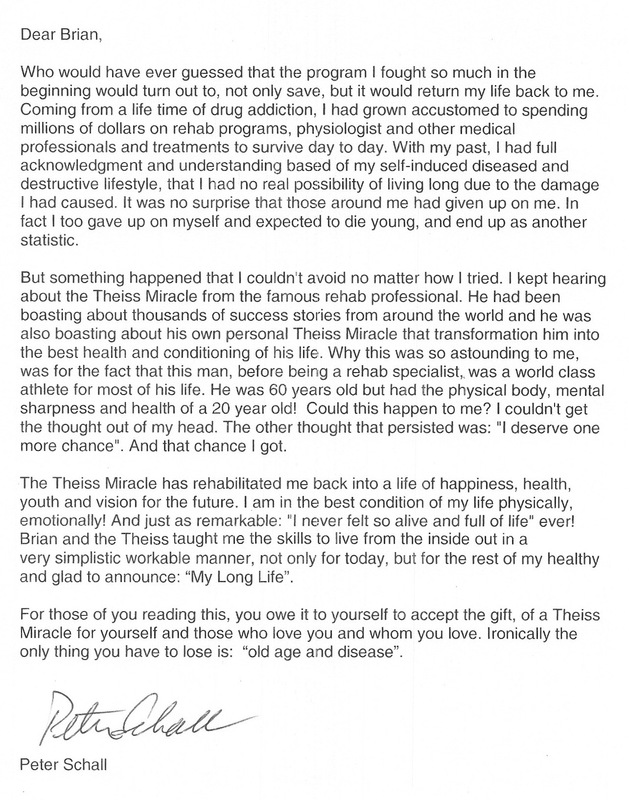 The Theiss Miracle has rehabilitated me back into a life of happiness, health, youth and vision for the future. I am in the best condition of my life physically, emotionally! And just as remarkable: “I never felt so alive and full of life” ever! 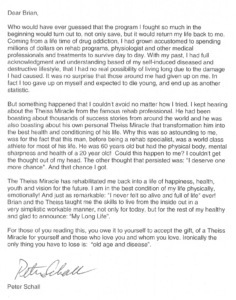 Brian and the Theiss Program taught me the skills to live from the inside out in a very simplistic workable manner, not only for today, but for the rest of my healthy and glad to announce: “My Long Life”. For those of you reading this, you owe it to yourself to accept the gift, of a Theiss Miracle for yourself and those who love you and whom you love. Ironically the only thing you have to lose is: “old age and disease“.